“In the future, we’d like to have more than 90 percent of hotel services operated by robots,” said Huis Ten Bosch president Hideo Sawada. In addition to the robots, Sawada says the 72-room facility will feature high-tech gadgetry aimed at making Henn-na the “most efficient hotel in the world,” The Japan Times reported. 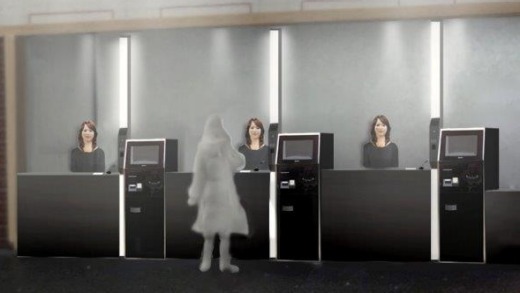 Hotel guests will also be able to access their rooms using facial recognition technology instead of room keys. Anyone uncomfortable with the system will be free to use old-fashioned keys, the hotel’s website said. Of course, it is a bit tempting to get carried away with the novelty of it, but as usual, the real story lies in what this means for employment in the (not-so-distant) future. The tendency is to think, hey, this could never work, but I suspect that that’s just a defensive mechanism we have to stop ourselves worrying about the implications. But the implications are obvious: less jobs for everyone. I guess you could argue that maybe people will be too freaked out and just won’t go there, but I really doubt that. It will be true for some people, but not for everyone. And gradually, this sort of thing will become less novel, more normalised. Henn-na Hotel has tentatively priced single and twin rooms at about $60 and $75 per night, respectively. Amazing how the rates go down when you’re not paying wages. So plenty of people will be enticed on those grounds alone (of course) and thus do we enter, however reluctantly, into the conditions of our own redundancy. You can check out anytime you want, but you will never get a job there. As usual, I’m not necessarily against these developments, I’m just stunned that the social and economic ramifications aren’t getting more attention.